Well... 6 days of bear hunting and I bagged a good one with the bow. Saw a total of 7 bears. Not allowed to bait here in CO. Just ground stalking and no calls for me. Had bear as close as 5 yards and as far as 70. Average daily incounter was 15-20 yards. Nice bear! Just broke mine back out after a few months off. Looking for blood this rut. Good hunt. Congratulations on your patience and success. Thanks! Yes it was a great hunt. First bear tag I have ever drawn actually. Took a few years to draw the tag with preference points. I had 16 different bear on my trail cams over a month period. Lots of young bears but a few good ones. I'll be doing a half mount with this guy. The tag I had was actually a rifle tag that coincided with archery elk/deer kinda. Was able to elk and deer hunt for a week and bear started 8 days later. So I decided to just carry the bow. I'm pretty dialed in through 70 with my bow and figured no need to bring the rifle. Hunting the wind was the key and with changing directions that made for a challenge a few times. But I could generally get within 20 yards without them having a clue! Gets your heart pounding that's for sure. Saw many, many deer but no shooter bucks. Let all the deer pass. Elk have been silent until this last weekend. First time I got a few bulls to answer my calls. And I have been on the woods 14 days over the last 5 weeks hunting and scouting. Came across some raghorn bulls and cows and calfs but no shooters. I have a few 320+ 6x6 bulls on my trail cams but they are still for the most part silent. No rutt activity yet. Will be heading back up for another few days here in the coming weeks to see what I can find. First time using Iron Will broadheads too. Impressed so far. We'll see how they do on a big bull. Only one way to find out. Last edited by Jwknutson17; 09-11-18 at 13:38. Congratulations, that is awesome. Taking game with a bow is very exhilarating always an accomplishment. 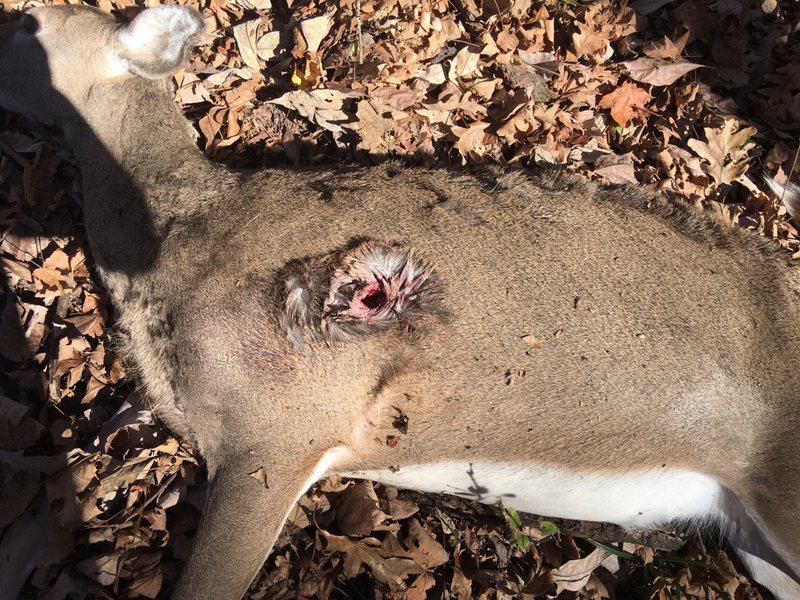 Doe taken with my 6.8spc shooting Hornady 120gr SST. Well Done Big man, that is awesome. Where you packing a large revolver on your hip? Great looking bear! Nice job doing it with a bow! Duck Tape can't fix stupid but it sure muffles the sound! Thanks. No. Just my Glock 19x as my normal CCW. Black Bears are so skiddish. I've never had a time where a bear didn't high tail it out if it smelled, saw, or heard me. If we had brown bear, I would have had my 300 win mag or 300 Norma mag with me. . Thanks man. Appreciate the compliment.